Yesterday I had lunch with my granddaughter at her school. I did not like school lunches when I was growing up. So it goes to show that I don’t like them now. It was pizza day which included a slice of pepperoni pizza, tossed salad with dressing on the side, apple slices, and milk. 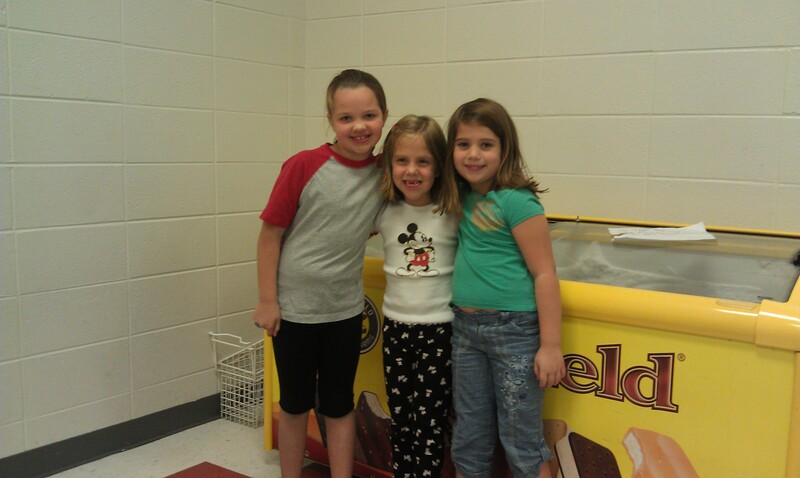 And because it is Friday, for 50 cents the children can get ice-cream out of the Mayfield Dairy freezer in the cafeteria. Some children prepay, like my granddaughter; some bring money that day; and most don’t get the ice-cream. This is because the majority of children at my granddaughter’s school receive financial assistance for meals, and ice-cream is not included. Parents and grandparents are encouraged to come to lunch, but not bring fast food for themselves or their students. And we have to sit at round tables away from the other children. This isn’t too bad because each student can invite two friends to join him or her. My daughter always invites one girl and then sometimes another girl or boy. My granddaughter brings lunch unless it is hot dog day or chicken nuggets day. She’s been eating fast food since she was old enough to chew. So far the hormones have not affected her. When I join her for lunch I buy ice-cream for her friends so that she is not eating her ice-cream in front of them. Last year I ate lunch before I came to the school because she didn’t eat until close to 12:30 and that is too late for me. But this year her class of first graders eats at 11:15. So I bring a turkey sandwich and a few chips. I buy ice tea from the school and assist the girls with opening packages, bags, ice-cream and enjoy hearing about their day. The teach ers don’t eat with their classes. The para-pros do. This is a term I just heard of since my granddaughter started school and is what we used to call aids or assistant teachers. This year she has only one in the classroom of 20, but last year there were three para-pros because her class was very unusual with a mixed bag of children all gifted, average or with learning disabilities including one with autism and he was a genius with Aspergers Syndrome. It was a wonderful class. This year’s class is pretty average, but she seems to enjoy it. 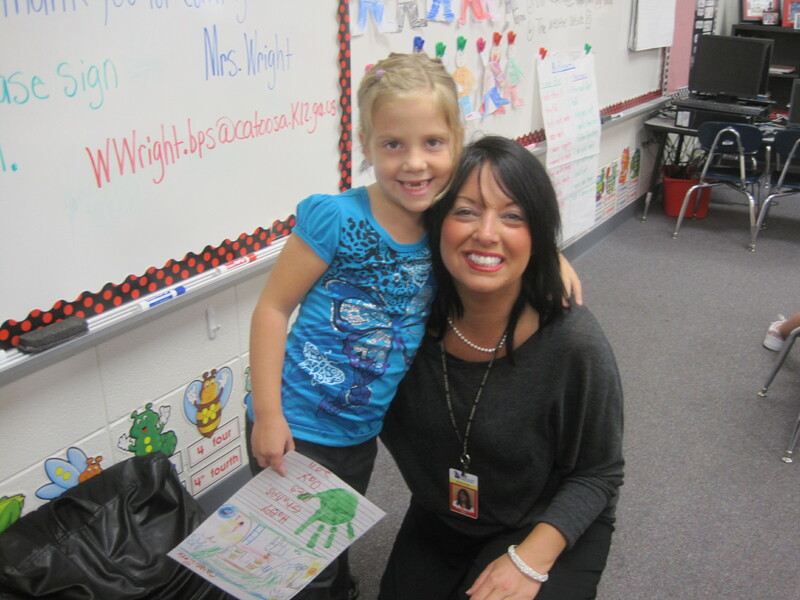 She loves her new teacher. And I enjoy having lunch with her. It keeps me young and keeps me visible in her life. I want to live for at least another twenty years so I can enjoy all my grandchildren. Part of doing that is taking care of me and that means doing positive things that make me happy. Exercise and healthy eating are right up there at the top of my list of things but more importantly is my attitude and the people that touch my life. Keeping them close to my heart, keeps me strong, and knowing when to say NO and when to say YES to a request; that is also very important to me. I have a very good understanding of what is right for me and who I am and that faith keeps me strong for I am who I am and that is good. Before the days of computers, our parents and grandparents used books, magazines, newspapers, dictionaries, encyclopedias, the library, teachers, and their own parents and grandparents to learn. Learning is a life-long task where we discover things created by man and revealed by God. And it is the best way to keep our minds healthy the older we get. My mother’s father read the daily newspaper religiously. The day was not right if the paper was late. This is because it was his joy to share what he read with his wife, my grandmother who did not have the time to read the paper. (Or maybe she chose not to do so that they could share that special time together. I will never know, because I never asked.) My father’s father was an avid baker, reading cookbooks and recipes he collected for years. He then turned around and gifted members of the family with a homemade cake or pie or bread. Both grandfathers stayed “young at heart” by discovering a way to keep their minds alert while doing something they found enjoyable. Both of these men lived and died without a television as children and computer their whole life and until the last six months of their lives, they lived normal healthy lives well into their eighties. My mother died, on the other hand too early. She lived a short sixty-three years, as did her mother and her grandmother. My mother lived a very addictive unhealthy life for the most part. But she was funny, kind, a good friend, mother, grandmother and wife. Everyone loved her. I never saw my mother exercise in her life – not walking, hiking, swimming, running, dancing, aerobics, nothing. And yet her heart and mind were strong and healthy. This is because she read books and magazines and always looked for ways to stimulate her mind. Her favorite magazine was the Reader’s Digest and especially Word Power, a regular column that lists words related to a theme with a multiple choice of answers for each word. Answers were provided but my mother never cheated. She worked diligently studying the words until she got them all right. My mother also grew up without a TV or computer but I feel certain that had she lived into her eighties as her father, she would have welcomed a computer in her home. Three generations later, I too, grew up without a computer, but there has always been a television set in my home as a child and today. And I have used a computer for over thirty years. But it was not until I started writing that I came to realize what a benefit to my health the computer is; for it is through the Internet that I search and research for the articles, stories, blogs that I write. Here I find recipes, spiritual guidance, articles on health and fitness, and mental strategies to stay alert. For example I signed up today to get A.Word.A.Day by Anu Garg through a daily email. It was free and like my grandfathers and my mother I can use the daily words to expand my world by forcing myself to learn something new each day keeping me well and whole and healthy. P.S. Today’s word is picaresque. “One of my favorite pastimes is watching the picaresque movie Robin Hood with Errol Flynn and Olivia DeHaviland.” ~ My sentence.